You have bought a beef steak from a great local butcher the meat is dark burgundy colour, the fat flecks are running through the steak and the fat has a creamy colour. 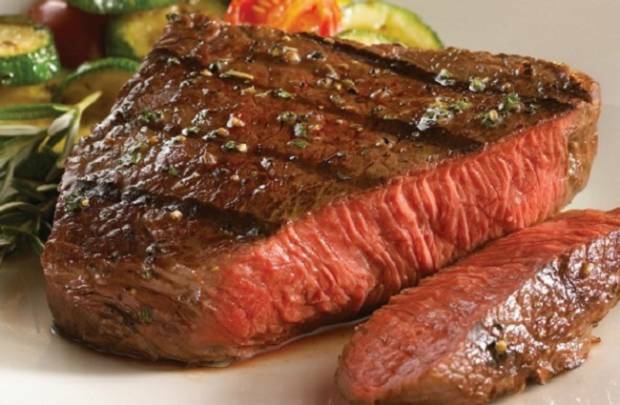 Allow your steak to come to room temperature before cooking. Season your room temperature steak with sea salt flakes and freshly cracked pepper at the last moment before cooking. Place into a hot pan with the oil of your choice I would use Yorkshire rapeseed oil as a preference. Depending how well done you want the steak you will generally need 2 mins each side for medium but this depends on the thickness of the steak but using an average steak this will work - remember when you see droplets of blood forming on the top of the overturned steak you will have your meat Medium rare to medium. Remove the steak and allow time for it to rest, at least 3-5 mins, keeping it warm before eating - this is important! Here is where you can add another sprinkle of sea salt flakes if you like. Keep those resting steak juices for your sauce they will add a fantastic flavour!